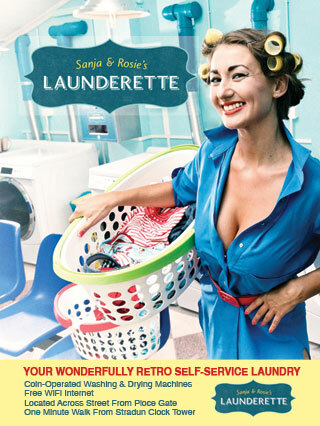 Sanja & Rosie’s Launderette is located in the lovely UNESCO world heritage site of Dubrovnik, Croatia. It’s the only self-service laundry in Dubrovnik. Conveniently located, the laundromat is just a couple seconds walk from Ploce Gate (one of the main gates to the Old Town). Plus, there are no stairs and it’s on the way to the beach! There can often be confusion with street addresses in and around Dubrovnik. To help you find you way, here is a google map. It is a short walk to the Launderette from the Old Town of Dubrovnik. From Pile Gate (the main entrance to the Old Town), walk straight down the main street (‘Stradun’) until you are in front of the Clock Tower (next to St. Blaise church). To your left, you will see a passageway that will lead you to Ploce Gate (the second main entrance to the Old Town). Follow it until you reach Ploce Gate (one of the main entrances to the Old Town). As soon as you cross the drawbridge, look to your left. There is a big sign that says ‘Sanja & Rosie’s Launderette’. We’re right next to Caffe Laura and Restaurant ‘Gusta Me’. Yay! You’ve found us! If you arrive by automobile, drive towards the Old Town. En route, it’s a one way street so you can’t really get lost, you will pass Hotel Argentina, Hotel Excelsior, the beach, and finally, when you see the monumental walls of the Old Town. Get ready to stop. The laundry is very close. If you want to quickly drop off your laundry before finding parking, take a right turn after Cafe Laura. The laundromat is located right next to the cafe. If you are looking for parking, there is paid parking along the street and a public parking lot about 100 meters away. Don’t park in the handicap parking spot (if you don’t have a proper sticker, it’s one of the tow truck drivers’ favourite hunting grounds).